This is THE BEST TASTING Whey Protein powder EVER. Seriously, it tastes like a rich fudgesicle. I got it to review and so far the only things I don't like about it is that it has a teeny bit of soy lecithin in it.... (for those who are avoiding soy), and that it is not made from grassfed whey. Also, it includes "natural flavors" which many times can contain MSG, but who knows for sure as it can be a trade secret. Nonetheless, it is awesome for a product that is just over $20 for 2 weeks supply (if you use 2 scoops per day) or 4 weeks supply if you use 1 scoop per day. Here are the ingredients and nutrition label for you to see the good ingredients. 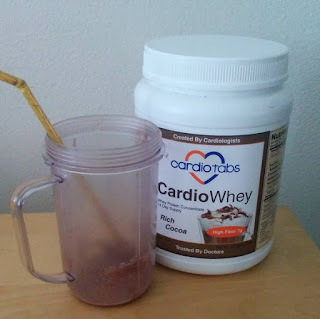 Like I mentioned, it has whey protein concentrate in it, which is far superior and healthy than whey protein isolate... (any protein isolate is severely processed into something not good for our bodies -- whether it is soy or whey). I know people have their favorite protein powders, many of which really are expensive, but this one is actually delicious and not bad for you (except what I mentioned above). It even has medium chain triglycerides to help with fat burning. Another ingredient I like is L-glutamine. This is one of the best things for the healing of the gut if you have leaky gut. Kids Keyboard Mat - Make Music and Dance!